Today was a very happy day for one of my lemongrass plants. 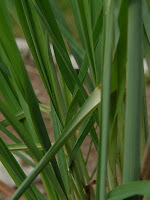 I love lemongrass, I really, really, really do, but it's a weed! Like any grass, it grows as much as it can and that can is quite a lot. I've got two monsters in 15 gallon pots that I divide down to 1/4 of the original size each autumn, and they've filled the pots again by the end of the summer. I usually start a bunch of divisions for trades and plant sales, and I ended up with an extra two or three this year. Instead of throwing them out, of course, I kept them. One is in a 5 gallon pot and the other has been trapped in it's one gallon pot since February. It's only grown 5 growths because of it's captivity, but they're nice, fat, healthy stalks with a handful of leaves each. Today, I took it out, attacked it with pru ners, and divided it up into single stalk divisions, pruned the roots and foliage. I swear, I think that the divisions have already started growing and have halfway filled up their 12 oz cups with roots. I expect that, by next week, I'll see the roots punching out braille 'LET ME OUT!!' in the styrofoam. I wish that the beasties would live outside and survive the winters because I'd have some honkin' specimens after a year or two. These divisions are located in my etsy shop here. now this is my kind of info. love gardening, growing stuff, etc. well, i love the idea of it anyway. i can never get anything to live long enough, lol! and i've been loooong wanting to get my hands on some lemongrass.